I have recently updated the map for this track. You can use the 4WD farm track, or the poled (green/yellow) track closer to the sea. The poled track is more interesting but there are some stream crossings and can be boggy in places after wet weather. 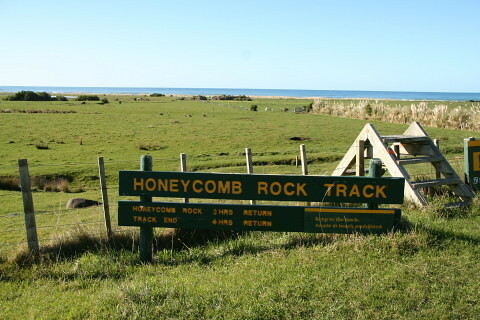 The route to Honeycomb Rock shown includes a mix of both tracks. The start of the walk goes across a few fields to bypass the start of Glenburn station, but joins up again with a flat 4WD track out to Honeycomb rock. There are several stream crossings and boggy areas along the route. The coastline has seals in winter. Allow 1.5 to 2 hours to walk the route one way from the carpark to Honeycomb rock (so about 4 hours return trip). Getting there takes almost as long as doing the walk! From Carterton take the road to Gladstone, and follow Gladstone Road to the Te Wharau junction. Follow the signs to Glenburn station, passing through Te Wharau settlement on the way. Glenburn station is about 60 km from Masterton, and the last 20 km of the road is unsealed. Allow an hour to drive from Masterton (it is about 2.5 hours drive from Wellington). Carterton is the nearest place for petrol, food and drink. There is nothing at Te Wharau or Glenburn/Flat Point, and there are no toilets. The track is closed for lambing in August - October. No shooting and no dogs, but mountain bikes okay.